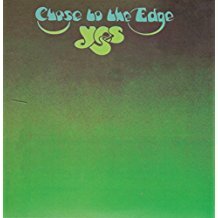 I'm not sure if I was exposed to this record first or the earlier "The Yes Album". Whatever the case was, the impact was astounding but just not a positive one at the time. It was 20 years later after much mocking of my Genesis and Yes loving mate Maurice that I had any appreciation. How could rock'n'roll possibly sound like this? There was simply no blue print or forewarning of what was to come. The ostentatious loftiness of the title track doesn't let you go for it's nearly 20 minutes. This recent 2013 Steven Wilson (5.1 surround sound) remaster is scarily brilliant. Chris Squire's bass playing is an absolute revelation and slaps YOU in this mix. May the great man rest in peace. I'm really sorry Maurice - you are da man!